Going green is always what EAST Hotel, Hong Kong believes in making the environment better and by using sustainability produce not only help to reduce cost but also can remain consistency in supply at anytime you wish especially they get it direct from their very own natural herb garden. Collaborating with World Wide Fund for Nature Hong Kong (WWF-HK) creating an all-natural herb garden. FEAST (Food by EAST) introduces Sustainable Seafood Wednesdays all year round with the issues revolving around over-exploitation and the depletion of the ocean’s edible resources. The menu is carefully tailored to use only seafood ingredients that have been approved by WWF-HK and certified by either the Marine Stewardship Council (MSC) or Aquaculture Stewardship Council (ASC), or in accordance with the Green/Yellow categories in the WWF-HK Seafood Guide 2014. FEAST is now serving salad and antipasti mixed with an array of ocean-friendly seafood at the antipasti counter, including freshly shucked oysters (Australian/French farmed), lobster (Boston/Canadian caught in the wild), mussels (Dutch caught in the wild), crab claws (Canadian caught in the wild), scallops (Canadian caught in the wild) and much more. For the main courses, Executive Chef David Parkin features a selection of five dishes to be rotated every two weeks, which include Traditional Fish and Chips (New Zealand Ling, caught in the wild), Grilled Norwegian Salmon (Norwegian farmed), EAST Fish Pie (Norwegian Salmon farmed, Canadian Scallops and Australian Prawns, caught in the wild), Thai Green Curry, Ocean Trout Fillet (Australian farmed), Sole Meunière (Dutch, whole Dover Sole caught in the wild), Tandoori Salmon Fillet (Norwegian farmed), and much more, along with a choice of steak and chicken for meat-eaters. With the growing concern of harmful chemicals and altered foods, Executive Chef David Parkin was inspired to initiate the EAST Urban Garden, to show support for the use of fresh and sustainable ingredients aimed at a healthier lifestyle. The hotel will use crops from the garden to make healthy and delicious dishes at FEAST(Food by EAST) and cocktails at Sugar (Bar.Deck.Lounge). Fresh giant prawns are not to be missed. Australian & French farmed oysters. Dutch mussels & Canadian crab claws both caught in the wild. The dedicated garden houses chemical and pesticide-free herbs, including basil, chili, lemon mint, parsley, coriander and more. To set up the garden, EAST has worked with Rooftop Republic, an organization promoting urban farming and sustainable living in Hong Kong, through farm set-up and maintenance services, interactive workshops, talks and events. 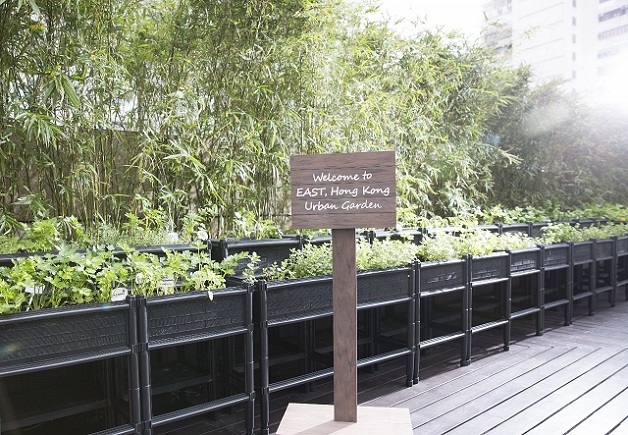 “We are glad to bring on board the Urban Garden to embrace sustainability and healthy eating. We are looking to further expand and develop this sustainable venture and plant more fresh vegetables.” said Executive Chef David Parkin. Have a look below feel good videos of Chef Parkin and his family using herbs from the garden to make exquisite dishes for a much sustainable life & style from the garden to your table. Seafood night is available every Wednesday, at HK$498 + 10%per person. Children aged 12 or under will enjoy a 50% discount. Email feastreservations@east-hongkong.com or call +852 3968 3777. Image & Video Credit: Copyright of mylifestylenews & EAST Hotel Hong Kong.